We had a thought while carrying our the recycling trash to the curb a couple of weeks ago. "Wonder if the top piece of plastic on that 409 bottle would be good for gaming terrain?" So, we set aside the bottom of the bottle. Sadly, we haven't thought of a cool way to use that yet. But, studying the top, we with a little bit of work, we did figure out how to get that outer "cowling" piece off. And, wow - the mechanism underneath looked very cool! We haven't figured out a use for the bottle yet. So, this was recycled. What we found inside struck us as looking very much like a laser turret. Mind you, there was an odd white and red tube protruding downward. But, for those of us with snippers, xacto knives or pretty much anything for cutting things, this didn't create a permanent set-back. We snipped it off! 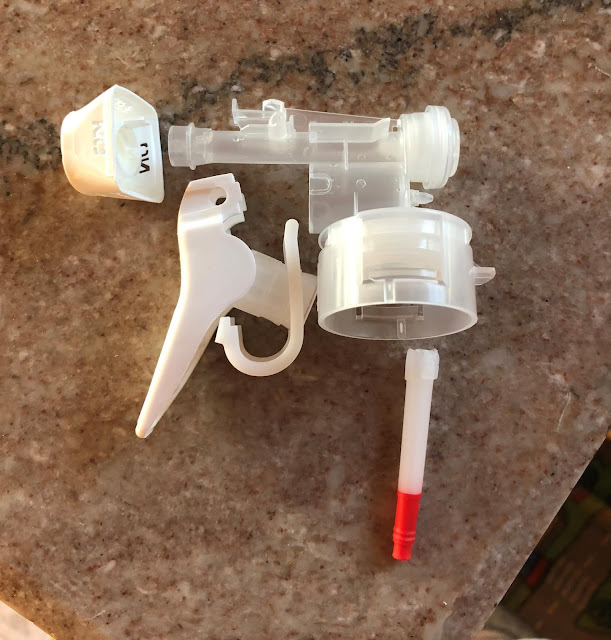 Here are the pieces of the spray assembly -- with the outer white cowling removed. In this photo we have already snipped the draw tube portion (the white and red tube) away from the main assembly. 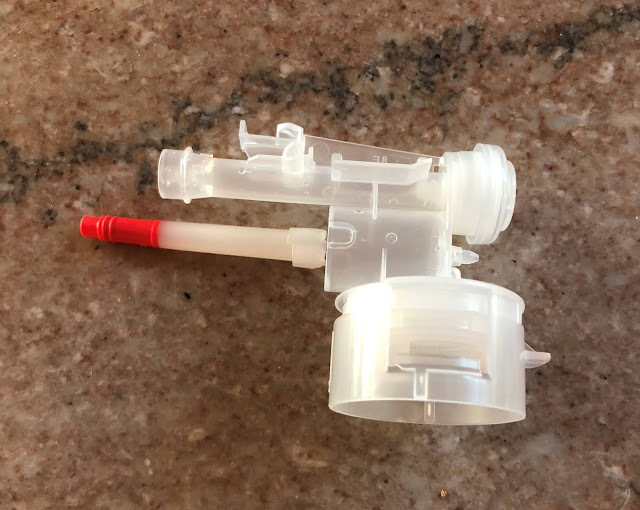 And, after snipping off that tube, we got to thinking how much cooler our concept would look if that tube was fixed to the lower tubular structure on the whole nozzle-trigger assembly. Here's where we wanted to fix that red and white draw tube. Pointing forward - maybe like it's for a ranging system for the main laser cannon. 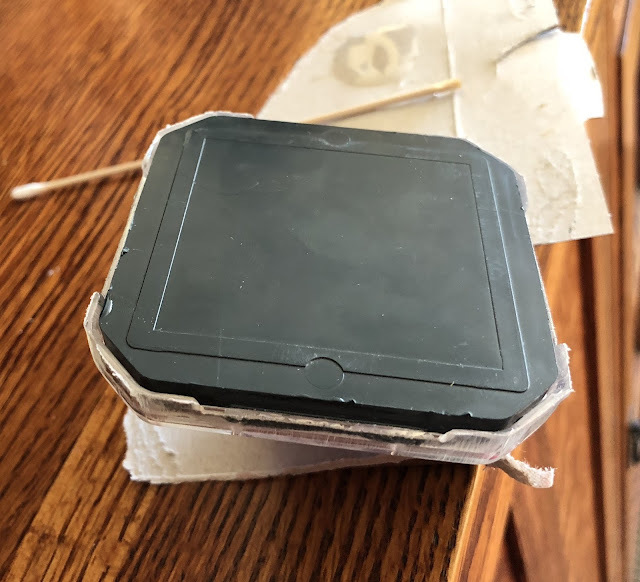 Next, we used some epoxy putty in two places. 1) Fixing that little white and red tube to the lower cylinder; and 2) Creating some weight at the rear of the unit sot that it would not flip over forward. We probably could have used straight epoxy (which we like for a use like this where fracture toughness matters). Or, super glue (which we are just not as good at). 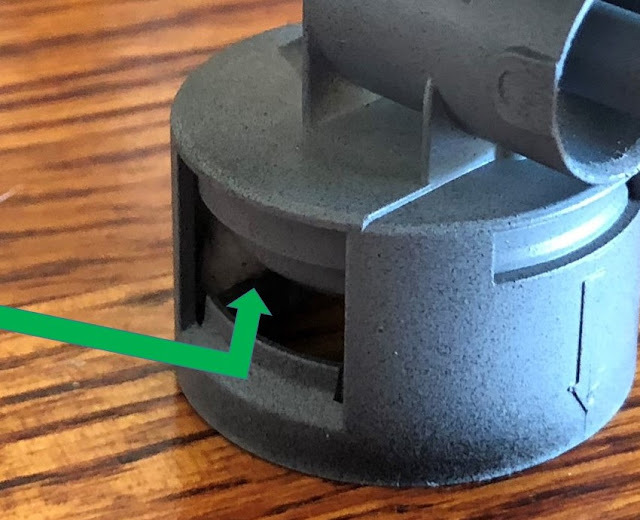 But, epoxy putty was nice for location (1) because it allowed us to fuss with the angle of the little tube to make it exactly match the angle of the upper main firing tube. Here's a link to our comparison of Epoxy vs. Super Glue - where we get into fracture toughness. Looking down the barrel -- you can see where we stuffed epoxy putty into the lower portion - and then pressed our red and white tube inside there. Here's a quick peak at the rear under portion where we added a little bit of epoxy putty to the inner walls. This shifted the center of mass so that it wouldn't tip over. We haven't done a lot of work yet on painting it. Just did some black and grey priming. Already, though you can see that it comes together pretty well as a laser turret! 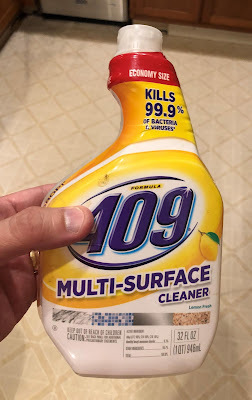 Fun that there is even a downward pointing arrow cast into the 409 bottle's plastic right in the front. And, the little beams and bars of the whole spraying assembly end up creating quite a sci-fi appearance. 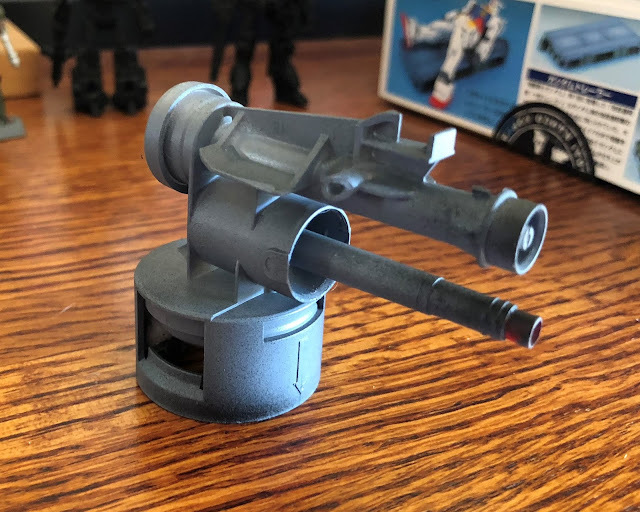 Here is a look at our finished turret. Going to have to think about how we want to paint it beyond this priming. We haven't used the turret very much yet. Just carried it around to check out next to other minis. Going to have to start looking for more of these in the recycling! On the playing table, turns out to look pretty cool! It looks just about right next to this rebel soldier! And, who knows, maybe there are other types of bottles with spraying mechanisms which are even cooler! It's now February, 3039 in our campaign. The team (which hasn't yet decided on a name for itself) has taken a job working for House Davion's equivalent of the CIA -- the Department of Military Intelligence, MI-4. Receive intel on the location in the McComb system of a House Kurita weapons and ammunition depot. Assault the depot - overcome opposing forces. With control of the depot, ensure neither the weapons nor ammo are available to House Kurita forces - i.e., take these off the market. Payment: since there can be no traceable connection to House Davion, the payment is modest -- but the team will receive 100% salvage rights including rights to captured munitions and equipment. Could we build a walled structure? If so, that would make an assault more fun - and make the scenario more interesting visually. We got to work on what to use to build our walled structure. Scrounging up four medicine bottles - we had three small ones and one medium sized one. Figured that would be OK because we could mount more things on the larger one. Next we marked the positions where we could add magnets to the medicine bottles. Was a bit tricky to mark the bottles at 90 degree angles. Managed to find a triangle square ruler which worked. Note the darned-slippery plastic which would not stick to superglue! Note: the plastic of medicine bottles does *NOT* stick well to superglue. Even when we roughed up the surface, the superglue was poorly bonded. We had tried superglue first - but had to re-glue all of the magnets with epoxy [you'll certainly notice our epoxy blobs on the final pieces]. We then used the trusty band-saw to cut our recycled plastic into wall pieces. We had learned on some prior efforts that if you cut the lip off the bottom of medicine bottles (to make the shape more clean) you also destroy the structural integrity of the bottle. So, for the sake of time, we kept that structure and simply put a notch in the wall pieces. Then, with the magnets glued to the bottles, we needed some steel on the wall pieces. We carved a slot out of the ends of the plastic and epoxy'ed nails in there. Then, we added some camo-type painting -- aiming for a city pattern. And, it seemed a bit plain after that, so we 3D printed a House Kurita banner with the one available on Thingiverse. The magnets worked. They are a little bit small - but do hold up the walls. The camo-painting was fun. We need a better set of patterns for doing this. We need to do something to cover our epoxy blobs. And, it would be fun to have a gate of some sort. And, lastly, the battle damage was a good idea! Lance member Buckaroo (a.k.a. Bob Bobson) fires on the Kurita strong-hold with his Centurion! Recently we've started up a Battletech campaign (earlier posting about that). And, we've been working on how to have fun terrain (earlier posting with terrain thoughts). 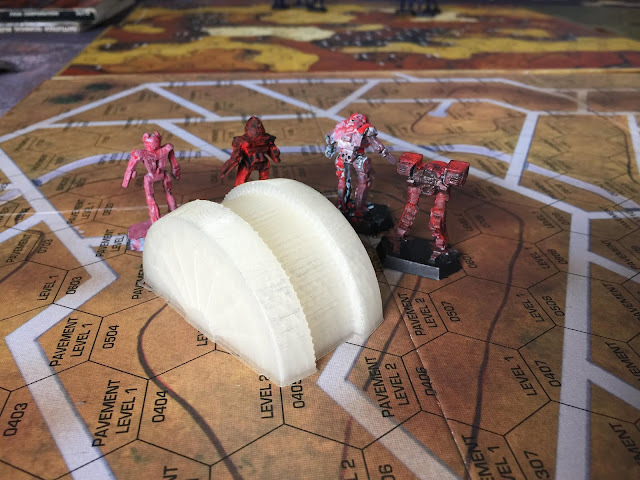 We've seen some nice responses to our earlier write-up that 3D printed terrain is a fun way to go. That certainly does sound good. In the meanwhile, we are posting a quick update after our first session using the HeroScapes terrain. - It was really cool to create 3D structures. We chose to put the "bad guys" for our campaign in a cave fortress with a turret gun for defense. Here you can see our Heroscapes 3D set-up on our battlemat. 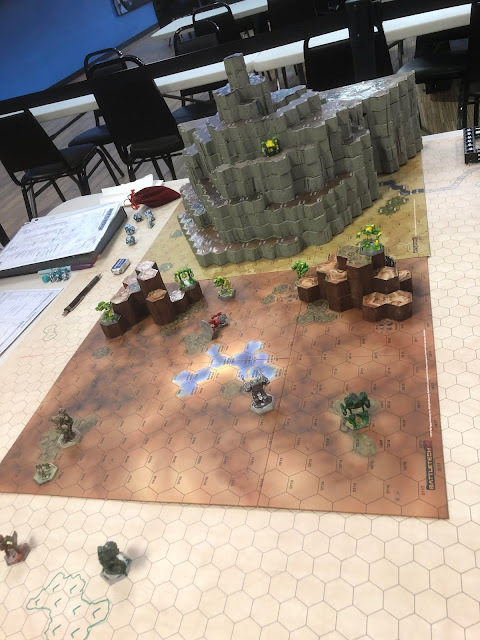 It was nice that we could slide the Heroscapes around and reposition during the session -- when we figured out that it would be better for the players to view things from the other 180 degree perspective. 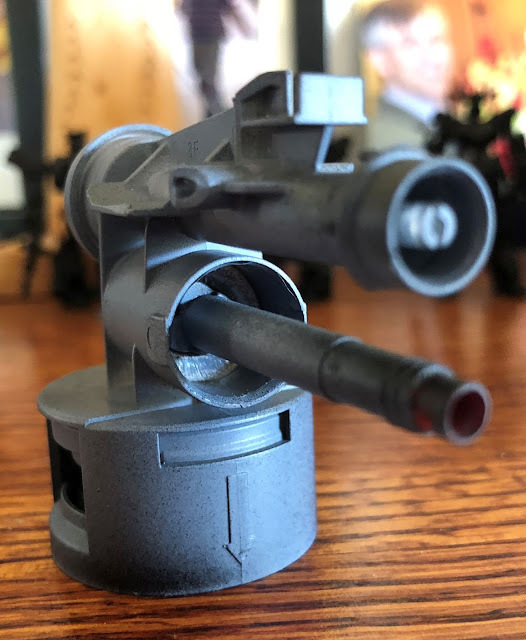 - The turret gun was a nice balancing element. As the GM we could choose it's armor level to help to ensure sufficient challenge for the team. We used a tank as a "jury rigged" turret -- mounted on a pedestal of stone and structure. The players could have attacked the structure if they had chosen - but instead attacked the turret until the large laser on the tank suffered a critical hit and was out of action. - The transition from the HeroScapes to the smaller-scale battlemat was annoying. The players put up with it - but it was not idea. Going to think about how to do this better. 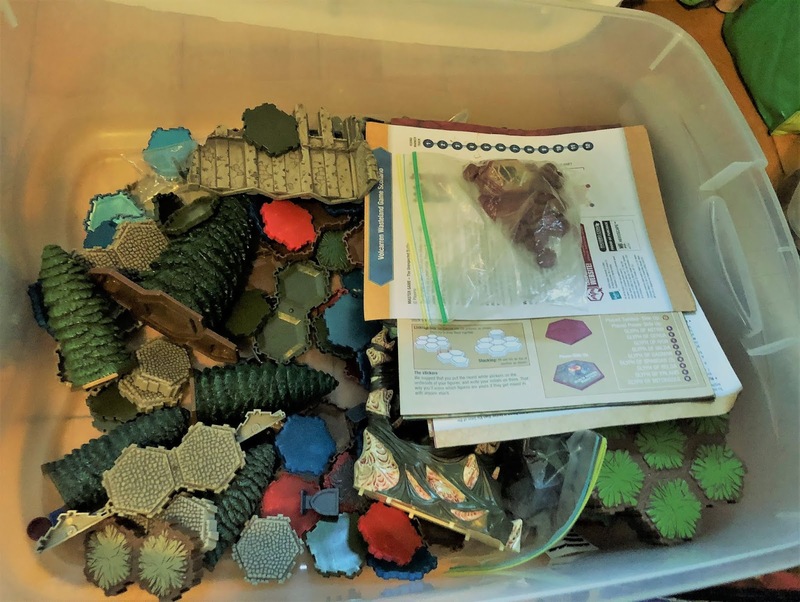 Do feel that if we had turned the battlemat by 90 degrees (so that it better aligned with the 60-degree orientation we had selected for the Heroscapes tiles, things would have been better. - Oh - and how cool that with the 3D structures we created, our team's Crab pilot backed his way into a crevace -- just like a real life marine crab -- so that nobody could get behind him -- and so that his pincers were facing outward!! The 'mechs up on top of the hill (Centurion and Wolverine) are attacking the turret -- their assignment was to take it down! Down below the team's Dervish and Crab are tackling a Trebuchet and Cicada. And, please note the fun position of the crab in the rock crevice!! - We used the thin green Heroscapes tiles for trees. This worked pretty well, and it was easy to place the trees quickly in a fun way. Thinking we may need some to be either lighter green - or maybe more splotchy to signify level 1 versus level 2 trees. - Lastly, our painting has made the larger Heroscapes tiles difficult to get apart. Planning to sand on those a little bit so that they are just a little bit more loosely fitting. We'll post further updates. In our next session we're going to use the fortress walls we built -- so that the team can assault a House Kurita weapons depot. 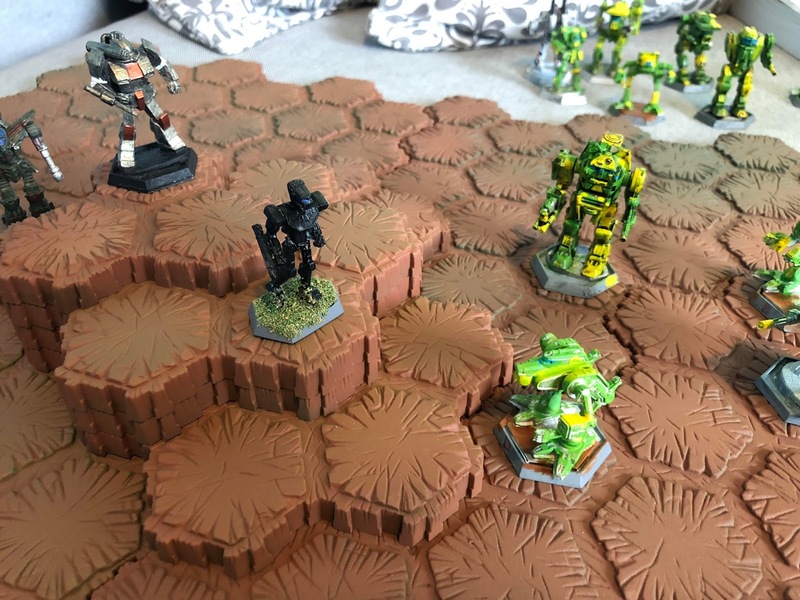 1) We do like the *BIG* battle-mat with smaller hexes. Have enjoyed using the big battle mat which has smaller hexes. 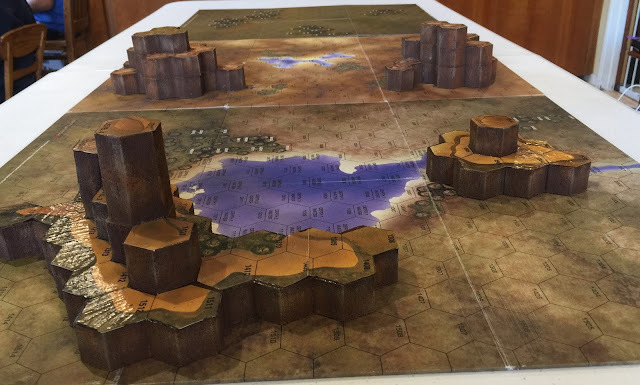 The big battle-mat with the smaller hexes is nice because a) it's really fast to set up (i.e., you un-roll it! ); b) you can write on it with over-head projector markers; c) it creates a sense of very long range. The down side is that it isn't pretty to look at -- going to have to think about ways to add color and terrain to it. When it creates a very long range sense, it allows for our *lance members* who like to fire from long range to have a drop zone which is outside of enemy firing range. When we use the cardboard maps which come with the table top game (which do look cool) -- then we have to use quite a few of them to create that same effect. We are thinking that what we may do is use the Heroscape tiles in the center of the battle mat -- and have a bit of a discontinuity in scale. Outside the Heroscape tiles - you're on battle mat scale ("super long range") and you count and move with the smaller battle mat hexes. Once inside the Heroscape tile space -- the tiles are larger and the more details throes of combat come into sharper focus. Here is our first set of pink foam 3-D structures to use with the standard box set maps. It was a lot of fun to have terrain which matched those cardboard map sheets. And, we even made a HUGE one to use with the map which came with one of the expansions. Here's a battle we run where we used our little pink-foam mountains and our really big pink-foam mountain. It is fun when there are such steep angles to consider. Brings up the question of whether or not to use the Pythagorean Theorem!! But, these are a lot of work to create. And, you can't really change them much once you have created them. And, (especially in the case of the huge one) they are not convenient to store when the game is over!! We've been watching these on eBay for a long time - but they've always seemed a bit expensive. Then, this past weekend we managed to get a set of them at the swap meet at our Mountain View Game Kastle store! The big huge trees are a little bit goofy - but the hexagon pieces are very cool! We realized that they were a bit rough (a little bit too bright?) in terms of colors - so have been working on painting them. Here's a quick look at them so far, with 'Mechs in operation. 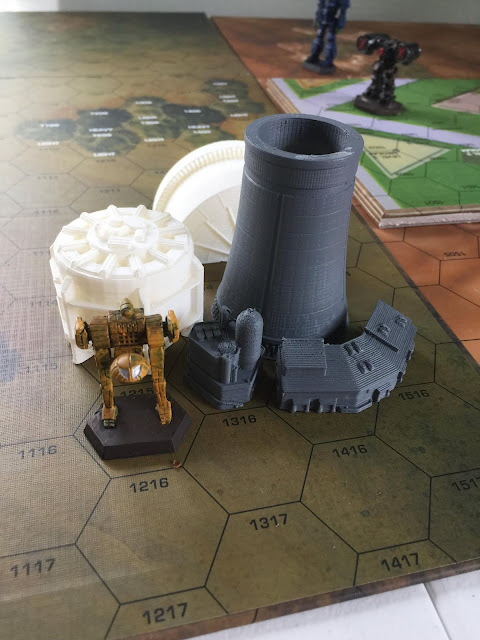 Over the past couple of years we've 3D printed some structures from Thingiverse which were tagged as Battletech scale. The only issue is that it's pretty easy to scoot them around on the board by accident. 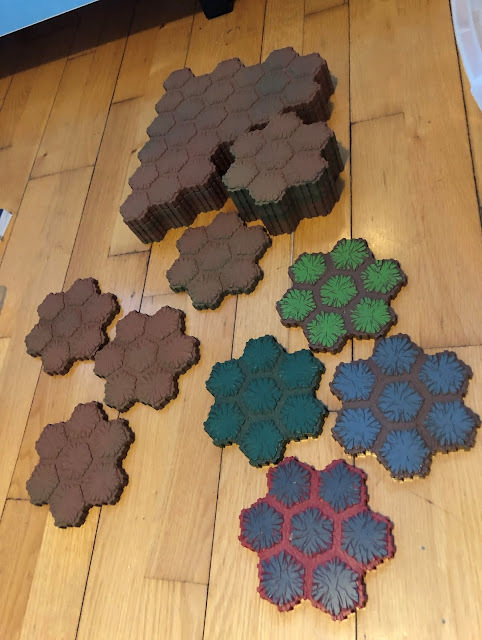 Thinking that we could mount these to those really flat tiles (maybe the red ones) which were part of the tub of Heroscapes. Here's a nuclear power plant we printed up. This is one of the things we could mount onto a set of 3-4 of the flat Heroscape hexes. This turbine was one of the first things we ever 3D printed. It looks cool - but it slides around very easily. Prime candidate for mounted on the hexes. 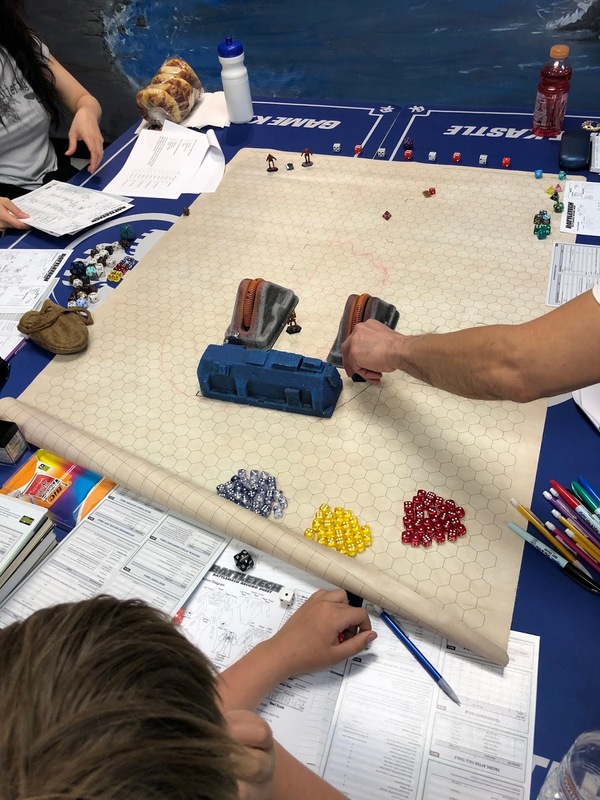 After our fun time "rebuilding" a dice-rolling tray using an old game we found in a thrift store, we've been thinking about other fun things we can create to have fun in our Battle Gaming sessions. Some of us may have seen the game Trouble. It's the one where the d6 (classic die) is under a plastic bubble in the middle of the game board. And, rather than having a chance to lose that die (you can't -- it's under the plastic), you push down on the bubble - there is a pop - and you release and the die is rolled. It's the apply named "Pop-o-Matic" die roller! Here's an example of the "Trouble" game we found -- with the Pop-o-Matic in the center. Well, we got to thinking that it might be pretty fun to rebuild one of those using some other dice. Or, maybe just cut that one out of the game board with our little band-saw and use it as is. And, that's when we discovered that there are randomness concerns with the Pop-o-matic. Mr. Jason Knight spells it out nicely in his blog post. The front page of Mr. Knight's post. Well, we certainly didn't want to go to the trouble of making something which wasn't very random. So, what to do. An idea struck - use smaller dice!! At first we were thinking to use some of our really-really-small d6's which we've accumulated over time. But, then at a great swap meet at our Mountain View Game Kastle, we found a super-sale on little vials of very small RPG dice. Here's a look at our vials of little RPG dice! Here is our Pop-o-Matic after cutting one out of the Trouble game-board. And, here we are gluing it back together. As we've posted before - we used epoxy to make sure our rebuilt Pop-o-Matic wouldn't break apart. And, with that, we have our finished product. As you'll see below, we couldn't really decide which of the little vial of dice to put inside -- so we put in all of them. And, that's pretty cool! You swirl the Pop-o-Matic around (to create a random initial state in honor of Mr. Jason Knight) and then Pop! the dice - and you have a full set of random results!! A super-short video of us testing out our Pop-o-Matic! What next? Maybe build another one with some other colors of little dice? (We chose the purple ones we had because of the very nice color contrast.) Or, maybe make one with very little d6's -- but five or six of them -- so that you have one Pop-o-Matic for games which have multiple d6's to roll. A quick blog post with updates on our feelings regarding Super glue vs. Epoxy -- now that we have discovered the existence of Super Glue Accelerators! 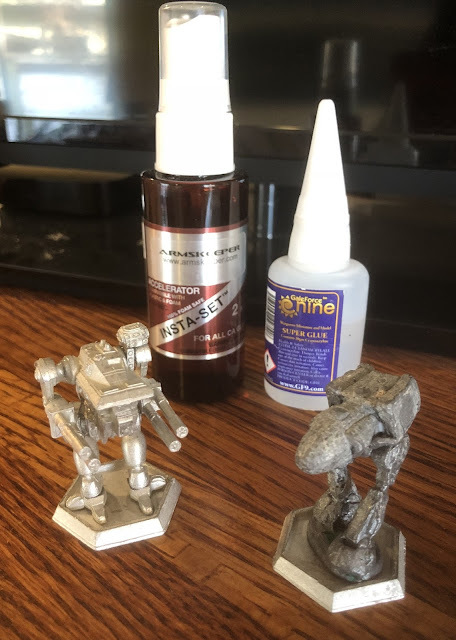 A few weeks ago, while playing our Starfinder Campaign - and working on the crazy idea of merging in Battletech 'mech fighting rules we got to talking about the table about glues - and bemoaning the reality (as we understood it) that only epoxy dealt well with metal models the likes of which you often need to use with Battletech. Then, Mr. T. (one of our friends and Starfinder player) chimed in that we should consider using a super glue accelerator. Don't recall what he suggested - something like "Zip It". We were absolutely intrigued. Is this the secret so many utilize to make superglue workable for them? Is this what we have been missing? Because, quite honestly, most of our experiences with superglue had been poor. Either we couldn't get it to set; or we glued our fingers together; or what we did glue fell and broke into many pieces. So, we asked more. "Be careful you don't burn yourself, though!" cautioned Mr. T. He went on to explain that the heat of reaction between the superglue and the accelerator released quite a bit of heat and that you could really burn your fingers. He indicated that he had done so many times over the years. Well, we had to try this out! Asking at Game Kastle in Mountain View we learned that they had two such products on the shelf. We picked out "Insta-Set" and headed home to try the stuff with one of our Battletech models (metal, of course). To try out the Insta-Set we figured we had better be careful! We were prepared for really hot. Used our needle nose pliers for some of the early piece holding. The bottle of Insta-Set uses a pump-spray action. It was a little tricky to manage in all angles. The liquid is quite volatile. The stain you see on our paper back we used to catch over-spray was gone within 15 minutes. And, maybe those were quite good precautions. First of all - we did learn just how hot the reaction can make things (quite hot - very easy to understand the burning risk!!) Secondly - at one point a little bit of glue got onto a glove - and the spray hit that - and WOW! quite a hot feeling to the fingers inside of the glove. The good news is that the hot, curing glue was not stuck to the fingers - and we were able to quickly rip the glove off and get the heat away from our skin!!! But, when all was said and done - it really, really worked. We whipped a metal model of a Clan 'mech together in something like 5 or 10 minutes. And, that my friends would have taken us hours or days or curing time with epoxy. Here are the two 'mechs we built up in 15-20 minutes. Much, much faster than we could have done with epoxy alone. 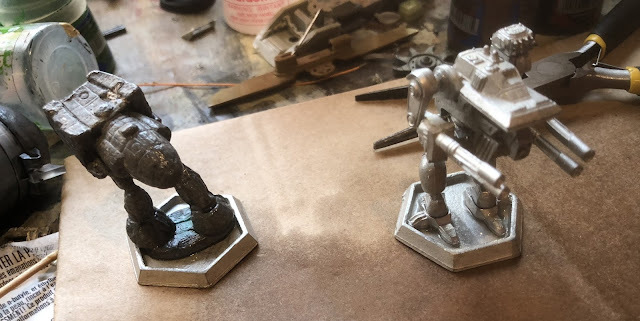 We built up another 'mech - a Stalker - which we had as bits - and then did a few tests to see how well the super glue bonds were holding together. Not too bad! The model was pretty sturdy! So, we certainly learned that the accelerator is truly useful product - though with hazards and requiring very careful use. 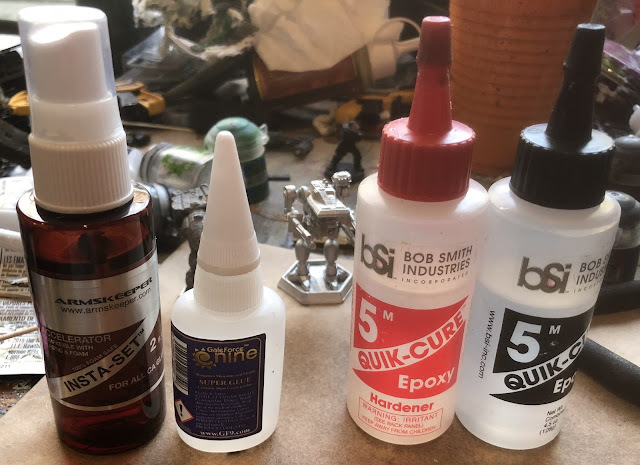 This stuff is great for working with metal models. And, we're guessing it's not bad at all with resin either. Be careful - wear gloves. So, you may wonder why after all of that we'd vote for epoxy when it is convenient. 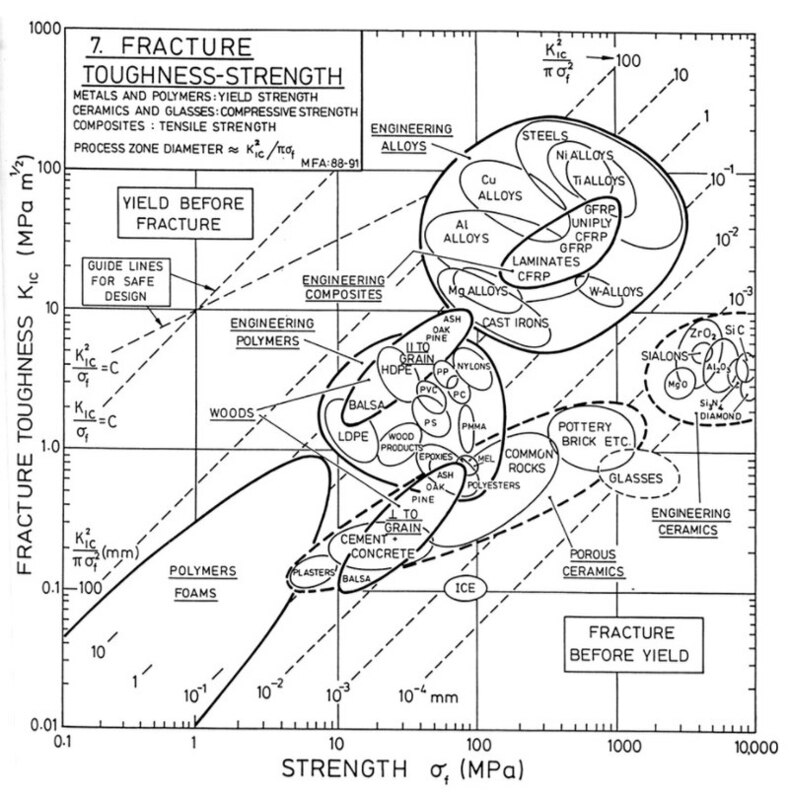 Well, it all comes down to *fracture toughness*. Our feeling is that even with the accelerator (which does cure the super glue) you still end up with a material which is more brittle - has lower fracture toughness - than the polymer you end up with joining your parts when you use epoxy glues. Here's a nice article talking in a bit more detail about the differences. 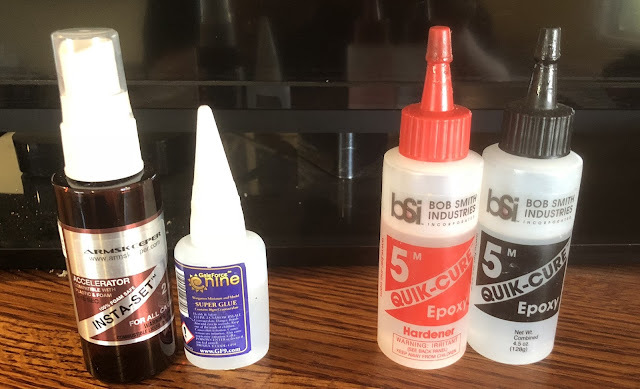 In their words, "Super Glue sets quickly and has a very low shearing strength while epoxy sets slowly and has good shear strength." A set of curves for fracture toughness of materials. Metals are up in the upper right. Things like glass are toward the bottom. We figure epoxy sits higher on a set of curves like this than super glue. 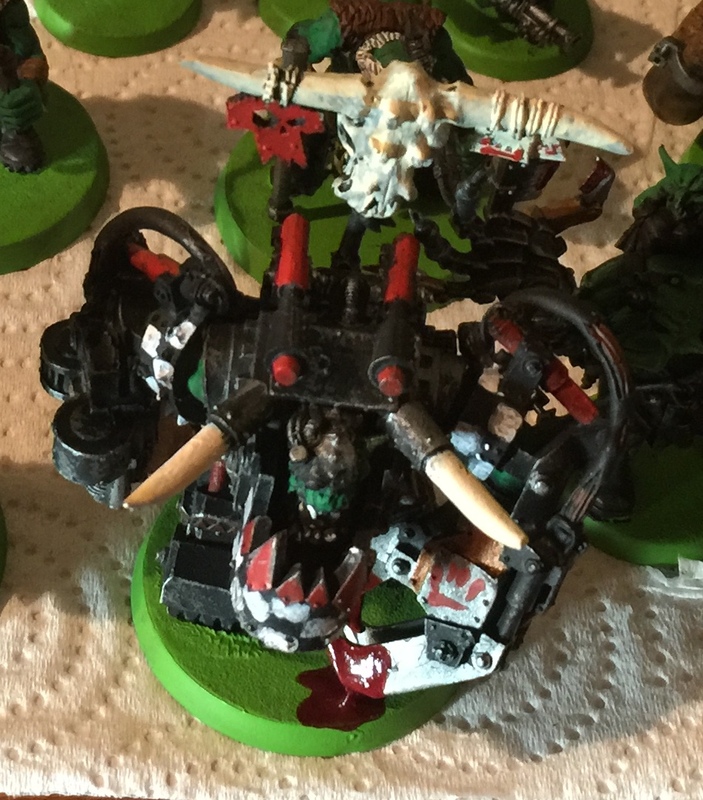 And, if you don't mind indulging the paint job which one of us (who is not so great at painting) managed, please check out our Ghazkull Thrakka. We gave up trying model glue (wrong for resin, we learned!!) and super glue (we couldn't manage it) and put him together with epoxy. And, yes, if you look hard at his joints, you find some globs of the stuff, which, while Orky do detract from the model's appearance. Here is our Ghazghkull Thraka model. Assembled with epoxy! A few months back we had a chance to make our first visit to Warhammer World. And, we had taken our trusty Battle Gaming One Ork and Space Marine along to take a few photos. But, we thought it would really be fun (if we were to visit again) to take our Ork Train to Warhammer World -- so that (at the very least) we could take some photos of the Ork Train on the very cool scenery there. Well, as it would happen, we worked it out that we would take our family vacation in London this year -- so this June we did have another chance to visit Warhammer World. This left us with questions to work out: What to take along; and how to pack it. Of course we wanted to take our entire Ork Train (as we had done when we went to Las Vegas Open). But... we had pretty nearly filled the car getting the Ork Train to Las Vegas -- that wouldn't work out for a trip by airplane. - Fork and Spork wanted to go along -- and they are relatively small -- so they were in. 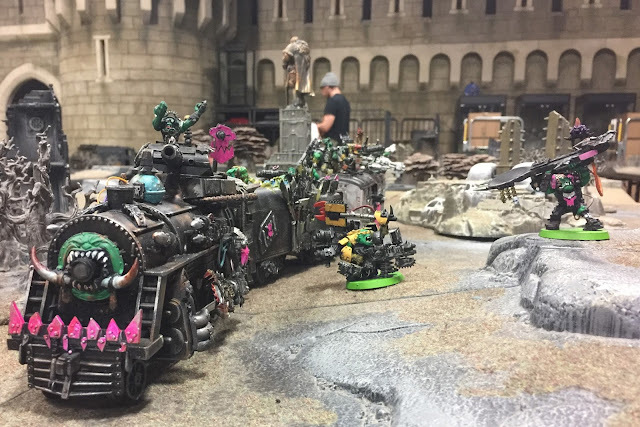 - The Dakka Chugga (our tyranid body powered Ork steam engine) was our first Ork Train element -- so we wanted to take it along for certain. - We wanted to take Da Pain Train (our Eldar-looted locomotive). But, it is a bit fragile (as we had learned by the amount of glue work required after the LVO trip). So, we decided it should stay at home. - So, in terms of priorities, we decided that the next fun thing to take would be our Ork-Gangster passenger car -- along with the Nobs with their magnet boots. 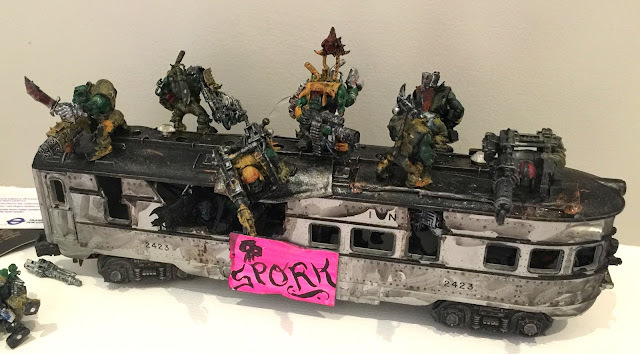 So, we were determined to carry the Ork Train on board. Luckily, we found a small carry-on bag which we could use to protect the Dakka Chugga pretty well. We put the locomotive (which weighs the most) at the bottom -- with lots of bubble wrap -- and a towel wrapped around it. We put the Tenda and the Ork Loota and Burna car on top of that. And, we placed Fork and Spork inside bubble wrap inside a hard plastic case on top off all of them. The arrival in London went fine. 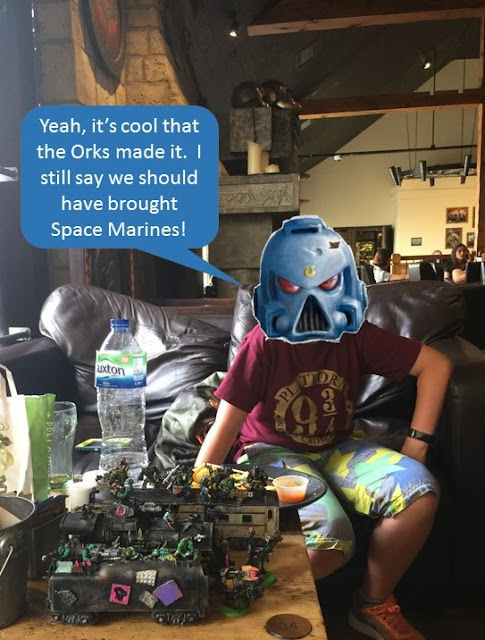 We were worried that our Orks might face some sort of immigration questioning (haha), but all went fine. And, here are Fork (left) and Spork (center). Some repair work to do on Spork's squig! Getting the Ork Train to Warhammer World once we were in London wasn't so bad. We simply packed it back up into that roll-on bag and away we went on the train to Nottingham! Then, when we arrived, what a treat. There were a number of large new terrain pieces at Warhammer World! We had a chance to have quite a few fun conversations. Met people from lots of different places. Great fun! Here is the Dakka Chugga at Warhammer World! We liked this photo because you catch the fortress background in the photo! We really liked this terrain piece - took photos with the Ork Train in lots of precarious positions! Fork and Spork supervising the progress of the Ork Train on the battlefield! More fun snaps with the Dakka Chugga! And, of course, had to have lunch at Bugman's! The trip home? Well, pretty much reverse course and do it all over again. Went just fine. Reflections on how to do it differently? Well.... It sure would have been fun to take track and a power supply and have the Ork Train running under it's own power at Warhammer World. ....Maybe next time! Plus, next time, shouldn't we have the full train? It'd be a pretty big suitcase - but would be lots of fun.